The oldest surviving medieval altarpiece in the UK has been returned to its home at Westminster Abbey after months of restoration work. The altarpiece, known as the Westminster Retable, was commissioned by King Henry III in 1270 just after the abbey was built. 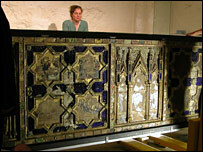 But the 11ft-by-3ft (3.33m by 97cm) piece went missing for 400 years and at one point was being used as a cupboard. The newly restored Retable will now be the centrepiece of the Abbey's museum. 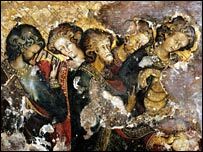 "We are absolutely delighted that the Retable is back home where everyone can enjoy this superb example of European panel painting," said the abbey's Canon Jane Hedges. The Retable is regarded as one of the finest pieces of Gothic art surviving in Europe. The central compartment contains three ornate arches flanked by columns and topped by gables and turrets, which imitate the portals of a church. An abbey spokesman said: "It's been really neglected over the centuries. "In the 18th Century, it was even used as the top of a cupboard. It's been quite badly neglected and we decided to save it from further damage." He said some of the ornate panelling and ornamental work had been badly damaged, with one panel painted over in the 18th Century when the Retable's value was not known. The restored Retable will now go on display to the public free of charge in the abbey's museum in the cloisters.